To succeed in a hunting trip, you need to make yourself inseparable from the environment. 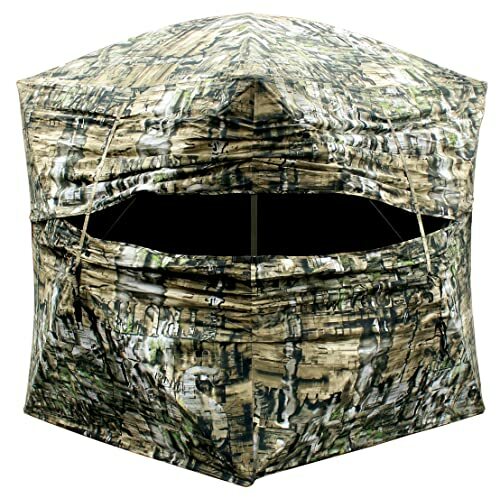 A ground blind is camouflage and provides warmth and shelter during hunting seasons. A great hunting blind will improve and make ease your bow hunting experience. When you are in the market for the best bow hunting blind, we know that we don’t have enough time to research. Here is a selection of ten best hunting blinds that we have come across after research. They are the best options for you to ground-pound turkeys or deer in your next hunting trip. Choosing the perfect hunting blind can be an important step in taking your hunting experience to the next level. Nowadays advances in camouflage have increased, and many new hunters are rushing to purchase one of these true hunting blinds. The problem is, the majority of the manufacturers are not delivering the high-quality blinds that are both effective and reliable. Some of them are concern about the quality, and they are reliable. The followings are our picks for the best hunting blinds. Without a doubt, the Double Bull Deluxe is a quality product. The Primos Double Bull Deluxe Ground Blind has zipperless double-wide opening for fast and silent entry, even with bulky packs. It also features a panoramic 180 deg full-front view with the Silent Slide window system. This hunting blind is easy to set up as it is equipped with the Double Bull hub system. Its patented Power Hub frame provides easy tightening and long-lasting durability. Comes with the legendary double bull materials and construction, this hunting blind will last for season after season. The Double Bull Deluxe Ground Blind by Primos is ideal for scouting new areas, hunting, or just game observation and photography. Its Truth Camo is designed to hide the blind in almost any terrain. The package includes four heavy-duty ground stakes, replaceable shoot-through mesh window panels, and a deluxe carry bag. The product dimension is 70″H x 60″W x 60″L, 77 inches hub to hub and weighs only 27 lbs. The blind also offers a lifetime warranty. Overall, great price for one of the best hunting blinds on the market. The Big Cat 350 hunting blind by BARRONETT offers a great concealment option that is affordable, portable, reliable and quick to set up. The blind provides all-metal hubs and solid fiberglass poles that ensures a stronger structure and long lasting reliability. It is large and spacious enough for a small group of hunters which is easy to transport, and also big enough to stand – so you will have enough space for the perfect shot. The big cat is made of high quality, unique fabric, smart hub technology, durable fiberglass poles. 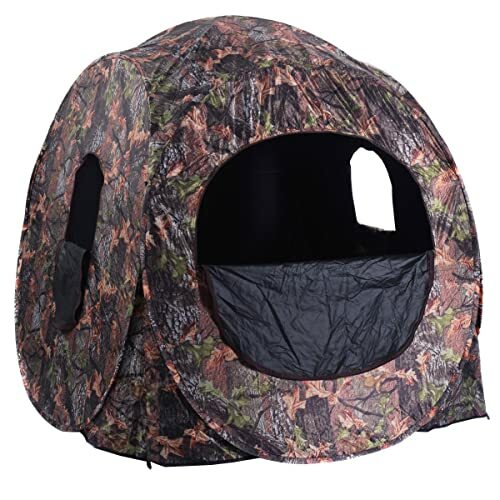 This hunting blind is easy to put up and very portable with its simple pop-up design. The Big also offers a perfect combination of depth and realism as it comes with Barronett’s exclusive patented BLOODTRAIL camo for the 3-D illusion of outdoor foliage. The Barronett is huge and spacious, has plenty of room for small group3 people comfortably. This blind offers an 80 inches height at the center for standing shots and 70×70 inches of floor space to give you and your friends plenty of room for gear. The ground blind also offers 90 inches hub to hub size for up to three hunters. It comes in a backpack style case, so it easy to pack in and out and weighs about 19 lbs for easy, and quick transportation. 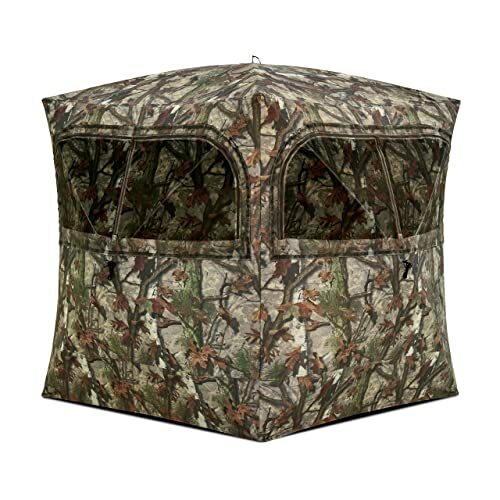 This hunting blind is made of durable, waterproof 150D Fabric with a black interior coating. 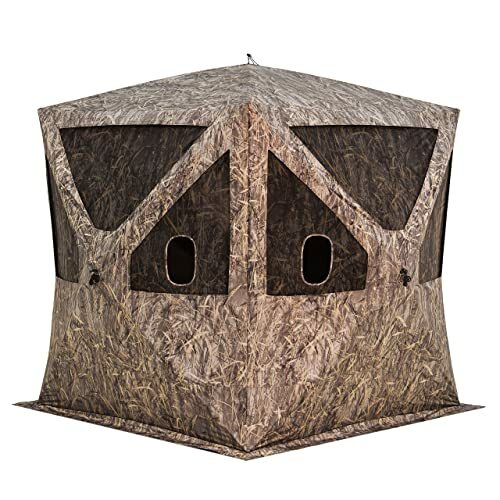 This is a perfect option for bowhunters and rifle hunters, as this ground blind offers a shoot-through mesh, which is adjustable to fit your shooting height. The windows are enclosed with adjustable camouflaged shoot-thru mesh. It features a Woodland Camo pattern. This blind also offers three tie-down stakes and ropes to ensure firm hold against blowing wind. This ground blind is super easy to set up within just a few seconds. It also offers vertical branches and meshes that blend perfectly with the surroundings. The Ameristep Care Taker Ground Blind is continuing to impress its customers year after year with its performance. This is a perfect beginner hunting blind. It keeps you dry on a rainy day and protects you from insects and bugs as well. The Care Taker ground blind by Ameristep is one of the most popular hunting blinds. With this hunting blind, you are getting the best buy for your buck. It features mesh windows on all sides, offers up to 360-degree viewing. It has three different windows that are covered with shoot-through mesh. It is 66 inches tall and 69 inches wide, and can comfortably accommodate two adults along with two chairs and hunting gears. The Ameristep Care Taker is one of the best lightweight blind that has easy setup and take down the facility. This blind can be used both for turkey hunting or deer hunting blind. The Ameristep Doghouse Hunting Blind is the most popular Ground Blind. 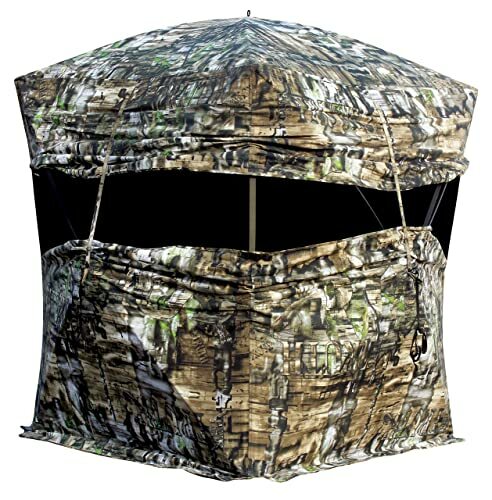 This is an ideal blind for rile or bow hunting and great for Photographers. The Doghouse ground blind features several top technologies of Ameristep to keep you hidden through firearm or bow hunting seasons. Its low profile design allows you to add an entirely new dimension to your hunting experience. 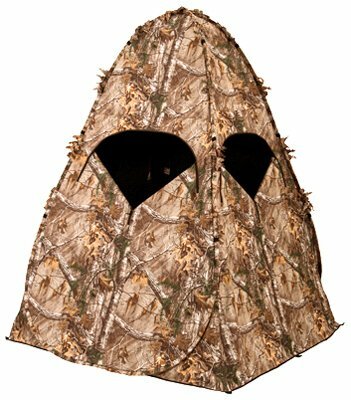 This hunting blind features shoot-through mesh to avoid anything in the way of you and your target. 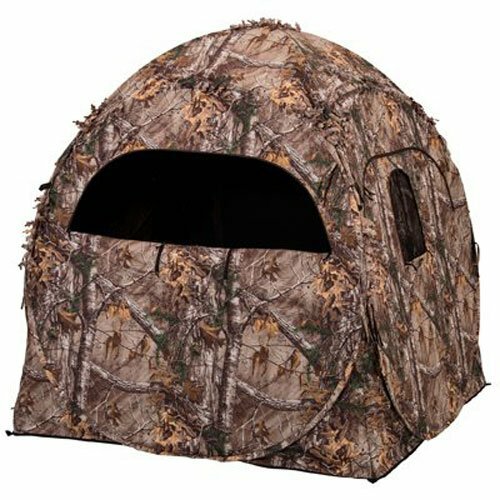 The Doghouse hunting blind features tough Durashell Plus exterior that provides durability, while the ShadowGuard interior eliminates shadows and silhouettes. This blind also blends into nearly any woodland environment with 3D Edge ReLeaf trim. Footprint 60”x60”. Height: 66”. This blind comes in a backpack carrying case that is quick and easy to transport. The Doghouse Hunting Blind sets up and takes down with ease, as it weighs only 17 lbs. And when staked out, it is easier to zip all the way closed. Overall, great price for a great product! The Double Bull Bullpen Ground Blind is made of polyester/cotton material with fiberglass poles and frame to ensure you season after season of use. It has enough room for multiple adults to sit comfortably while remaining concealed. This hunting blind features 180 deg full-front-view window along with patented Double Bull silent slide window closures. The Double Bull quiet slide window system allows you to set up the blind for rifle or bow hunting perfectly. Its rugged hub construction is easy to set up and take down for quick getting in the hunt. This item covers a manufacturer’s limited lifetime warranty. Hub-to-hub width: 70 inches and weighs about 23 lbs. This hunting blind blindfolds compactly and comes in a carry bag for easy transport. Overall, excellent quality and great size! You will be very satisfied with the purchase. The Ameristep Deluxe Hunting Blind features a compact, unique design that allows two persons and boasts a large open front window. The large front and side windows offer you excellent viewing angles to observe your prey. The Realtree Xtra camo pattern is very useful in the wild and allows you to follow your prey without being noticed. The product dimension is width 61 inches, height 60 inches, and depth 52 inches. This hunting blind is ideal for firearm and crossbow hunting. And no assembly is required. This waterproof ground blind is made of 50% Polyester/50% Cotton. 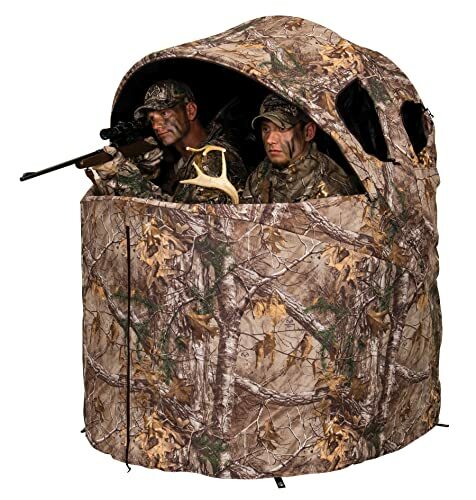 The Deluxe two-person blind includes a chair with a cup holder and armrest, so you can stay comfortable while hunting. Its Shadow Guard coating eliminates shadows and silhouettes. It measures 61 inches wide and 20 inches high that offers enough room to maneuver your bow or rifle. The package includes carrying case with shoulder strap. The Easy Fold Tent Chair by Ameristep is one of the most famous blind available. This is a perfect ground blind for one person who wants to create a minimal visual profile and if you are carrying lots of hunting gears. But still, this hunting blind can accommodate two persons. Its zippered side windows and wide front opening give you several different viewing angles, allowing you for comfortable shooting. The fabric used in this product is durable and waterproof. 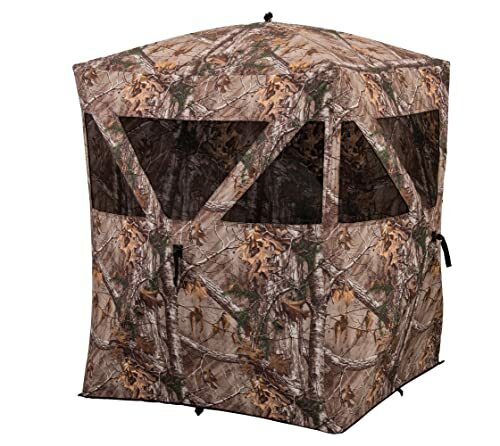 The Ameristep Tent Chair Easy Fold Over Ground Blind is made of 150D polyester with black ShadowGuard coating. So it keeps you dry inside this blind. Your weapons and gears will also stay dry inside. The chair is attached to the blind for quick setup, and you too will find a cup holder with chair’s armrest. The flip over feature of this blind will help you in many ways. So, you will be able to use this ground blind for several trips. The Outhouse is a quick set mechanism steel ground blind designed for firearm or crossbow hunting. From setup to transportation, the Outhouse is a suitable blind for any hunting trip. It has a spacious design that offers plenty of room to maneuver your firearm into position. When assembled, the Outhouse is tall enough for a standing adult. 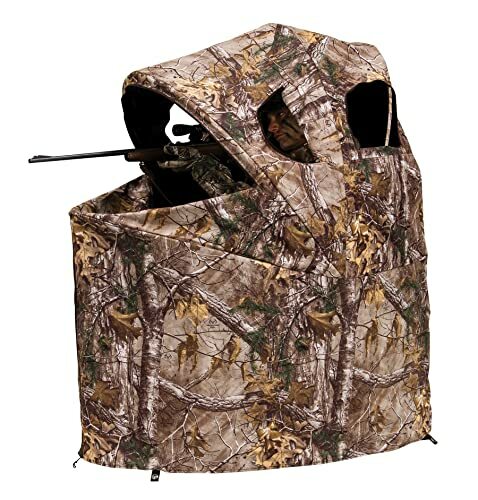 When packed, this hunting blind is lightweight and compact for easy transport. This single person blind sets up in a few seconds, and this is a great choice for extra concealment when the bow and gun hunting. The Realtree Xtra Camo pattern makes it ideal for rifle and crossbow hunting. This blind is extra-quiet, wear- and weather-resistant. It is made of DuraShell Plus fabric that conceals and protects you from the elements. The ShadowGuard coating of the blind eliminates shadows and silhouettes so that you can stay hidden. The Outhouse includes a carrying case and instructional DVD. Lightweight for easy transport, weight: 9 lbs. The Tangkula Ground Hunting Blind is built from waterproof 150D Oxford and PU Coated materials. This blind is made of polyester, it can resist harsh weathers. This blind gives enough room for three hunters sharing as it has a shooting space of 58″ and height of 65″. The side of this blind is 61 x59 x63 inches, and there are small windows as well. The falling-leaf style camouflage pattern allows you to stay blend into the surrounds without being noticed. And this is perfectly suited for the autumn season. This blind is lightweight, so you can take it on any hunting trip with you without being weighed down. This unit features superb construction materials and the fiberglass frame is stronger than other competitors frames. There are six windows to give you extra awareness of your hunting zone and they also feature shoot through mesh. This ground blind is very easy to set up and can be quickly folded. There is nothing to worry about the installation process, convenience, and fast set-up is ensured. A hunting blind can be an excellent addition to your hunting gear. Considering your prey, and hunting season, you should choose a camo pattern that gives you the maximum concealment in the wild. These blinds will offer you close-up access to wildlife by keeping you blended into the scenery. Most of them can also keep you protected from the elements. We hope this article helped you decide hunting blind purchase and we wish you the best!